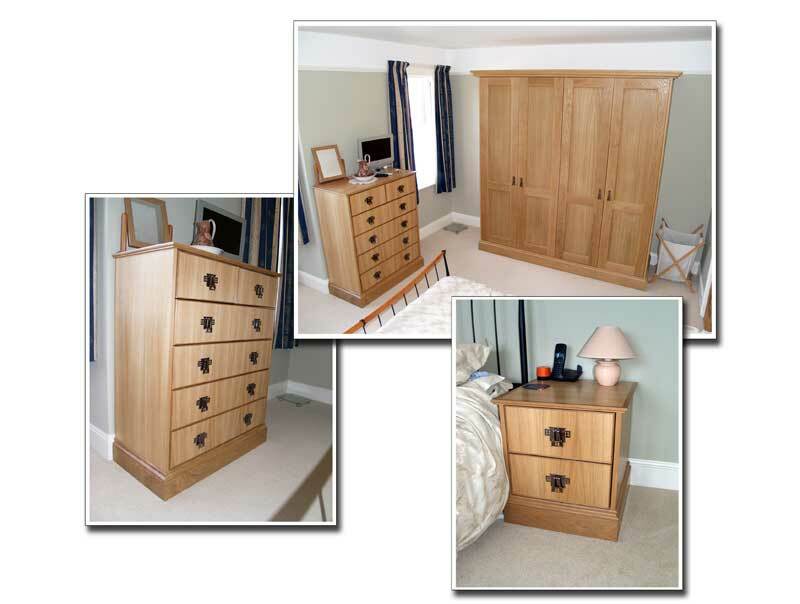 Bespoke solid wood Bedroom Furniture. For many people, the bedroom is more than just a place to sleep - it's a refuge from a hectic work schedule or demanding family life. So the last thing anyone wants spoiling their personal sanctuary is clutter! The time often spent looking for lost items amidst the mess only adds to daily stresses. Furniture to fit can help you de-clutter and organise your bedroom, with custom-made, clever storage solutions that maximise the available space regardless of the size or shape of your room. Whether you need a cavernous wardrobe or cabinet, a sturdy chest of drawers, a bed with hidden storage, shelving, a wall unit, a blanket box or a dressing table, we can design and build coordinated bedroom furniture with the right combination of shelf-, hanging- or drawer space to suit your requirements. The Brief: Maximum clothes storage to suit the style of the house. Solution: Large 2.3m tall solid oak wardrobes that can easily swallow a lot of clothing. Inside, the space is divided between shelving and hanging rails. A 900mm x 1200mm chest of drawers with heavy duty drawer runners and drawer fronts finished with a cot bead. A matching bedside cabinet gives additional storage, as well as room to stand a phone and lamp. Finish: All pieces were finished in solid oak and veneer with cast handles and solid oak skirting and cornicing.